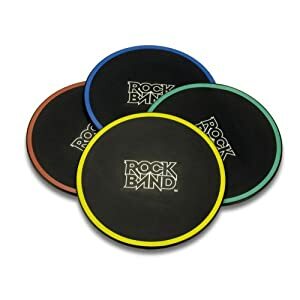 With the insane popularity of games like Rock Band and Guitar Hero for the Nintendo Wii, tons of accessories have sprung up that are designed for the drum kit. Some work to improve the life of the Wii drums, while others are just for fun. There are a lot of different choices, and some are higher quality than others, so I want to show you some of the best Wii accessories designed for the drums. The most useful of all of the drum accessories is the Rock Band Drum Pad Silencers from PDP. These have two functions. The obvious one is that they reduce the noise of the drum sticks hitting the pads, which allows you to jam late into the night without disturbing anyone. Another good thing about these drum pad silencers is that they extend the life of the drum kit. Instead of beating up the stock pad, you can take it out on the drum silencers. These only cost about $20, so having to replace them is much more affordable than replacing the entire drum kit! Another really cool Wii drum accessory are the Illuminated Drum Sticks by Peavey. These won’t help you play any better, but they will help you look cooler while doing it! They come in both red and blue, so you can pick the color that suits your style. When compared to wood drum sticks, these aren’t going to last as long, but if you don’t beat up your drum kit you should be able to get a lot of use out of them. My favorite accessory for Rock Band is the Double Cymbal Expansion Pack by MadCatz. This addition turns your drums into a full kit. Two extra cymbals are added on stands that can be assigned to whichever color you want them to be. You can now really shred on your drum kit with the addition of the extra cymbals! None of these drum accessories are needed to play the games, but add a lot of extra fun to game play. There are other companies that make the same accessories, but are generally much lower quality. It doesn’t cost much money at all to expand your drum kit to a legendary level so you can get as much out of the game as possible!